Do you Possess Psychic Powers? Psychics, Saints, Guru's, Adepts, Teachers, Masters etc. Chi Kung / Qi Gong - The Super Natural Path © Roger Jahnke O.M.D. This page is full of facts about Psychic Powers, especially with respect to the ancient art of Qigong. As well as our regular 5 senses there are many more that we don't take account of. What about the sense of balance?! Also what about sense of humour?!! According to Dr Joshua David Stone we have 22 senses. He also suggests there are 27 veils. Basically special powers or Siddhis are not necessarily signs of spiritual development. One can be a psychic and not be spiritual. Miracles are based on the law of karma & synchronicity - where the gap between intention & manifestation is shortened. To develop miraculous powers we need to develop and train our powers of intention & attention. We all have the ability to send and receive information on subtle levels, we do not need a fortune teller or psychic to tell us what to do. However we need to clean our connection within in order to receive and transmit information / light / energy /chi. In fact many of us already receive information -through, gut feeling, instinct, inner knowing, inspiration, hearing thoughts, seeing images, dreams etc.- We just need to be aware of it. We are likely to be natural at certain psychic powers. Visual - Clairvoyance, Feeling, Kinesthetic- Clairsentient, Hearing, Audiory - Clairaudient. I can feel energy in between my hands. Energy between my hands feels like magnetism & electicity. I can sense auras and negative energy fields. This means that I can find where there is excess chi (vital energy) or deficient chi in the body / energy body. This is how Native American indians diagnose, except they use a feather or drum to dowse & amplify the reading, as they pass it over a the chakras and energy meridians. Once I know where there is an imbalance I can work on balancing the energy and unblocking any channels. I have also developed my intuition - inner knowing - the 'still small voice within'. I seem to know what the 'right' thing to do is. Likewise my visualisations have got more vivid as have my dreams. When our minds are quiet and still we can receive information.When our minds are distracted, agitated, excited, lazy or dull we can not learn anything well. Intuition is true knowledge, this comes through meditation, patience and effort. Other people may be more visual and thus can easily see auras clairvoyantly. However beware - many clairvoyants see different colours and associations. Each has their own interpretation, none are necessarily superior or more correct than others. See what works for you. It is said to be located between the eyebrows or in the middle of the forehead (in line with pitiuatary gland). There is much info on opening the third eye. The third eye is the eye of insight. Insight into the true nature of reality / things as they are. By focusing on the third eye people find they we can keep concentrating for longer espeicially if tired. There are many levels of opening. One should not get attached to these powers or use them to manipulate anybody's free will. Be careful what you wish for. What goes around comes around. Clairvoyance, ability to see or visualize objects and events beyond the range of normal sight. Clairvoyance is a form of extrasensory perception, or ESP, which includes any ability to gain information by psychic means, rather than through the physical senses. According to belief, clairvoyance usually occurs when a person with clairvoyant powers is in a state of trance, during which that person can describe the objects or events that appear in his or her mind. Most scientists, however, deny that claims of clairvoyance have been supported by any substantial evidence. There are several explanations for clairvoyance among people who believe it occurs. Some people believe that a clairvoyant person gains psychic visions through communication with spirits. Others claim that clairvoyance comes through telepathy, the ability to communicate with others using only the mind. Another explanation says that clairvoyant people get their information through their own special abilities, without direction from another person or spirit. "Clairvoyance," Microsoft® Encarta® Online Encyclopedia 2000 http://encarta.msn.com © 1997-2000 Microsoft Corporation. All rights reserved. We all have these four psychic senses however we are naturally stronger in one or two of them. One can develop these, but generally they develop naturally as you move along the spiritual path, it is smoother like this. Be careful what you wish for. Always add. '........with divine will, or for the greatest good, for the highest divine purpose, in the name of Jesus etc., to whatever you wish for. Any manipulation of energy / powers for your own benefit is the work of the ego. Manifest things in accordance to Divine Will, or the Divine Plan (love). When having a shower imagine the negative energy being washed off yourself! - into mother Earth to be recycled for good. divaya-cakesus - heavenly eye,"the penetration that sees things in the heavens"
divaya-srotra - heavenly ear,or the "penetration that hears things in the heavens"
parachitta-jnana - "the penetration that knows others' minds"
purya-nivasanusmeti-jnana - "the penetration that knows past lives"
rodhividhi-jnana - "the penetration that traverses everywhere"
asravaksaya-jnana - "the penetration that fills everything"
"the penetration that traverses everywhere" refers to the ability to go through obstacles (as in Zhang Boasheng's ability ti walk through walls). This includes the ability to transform oneself into a spirit and go anywhere, such as the skies or underground. "the penetration that knows others' minds" is like the ability of Zhang Yuji - in other words telepathy. Zhang Yuji also has "the penetration that knows past lives" and can tell the past and the future. "the penetration that fills everything" is the highest of the six penetrations, and only the immortals attained this level of power. Lord Buddha and Guan Yin / Shiyin are examples of such immortals, who had mastery of the whole world and could do anything. Master Zi Sheng Wang (pronounced W-ah-ng), preeminent Qigong healer, has been studying Qigong for almost 60 years. He has developed the unique ability to transmit energy to tens of thousands at a time, even across vast distances. The International Chinese Medicine Congress honored him as the Most Outstanding Qigong Master of the Year in 1998, and he is recognized as one of China's foremost energy healers. In Beijing, he has coached some of China's top athletes. He is a board member and advisor of many Chinese Qigong associations, and is the founder and president of the San Francisco based International Tibetan Qigong Association. He has authored the book, The Path of Dzogchen, soon to be released in the U.S.
ANIMA, the power of making ones body or anything else as small as he likes, even as tiny as an atom(anu). MAHAMA, the power of magnifying or making ones's body or anything else MAHAT, as large as he likes. LAGHIMA, the power of making one's body, or anything else LAGAU, as light in weight as he or she likes. GARIMA. The power of making one's body, or anything else, as heavy, or guru, as he or she likes. PAPTI. The power of APTI or obtaining anything he or she likes. VASITWA, The power of VASA, bringing anything under control. PROKAMYA. The power of satisfying all desires, KARMA, by will-power that is irresistible. ISITWA. The power of becoming ISA, LORD over everything. See John 14:12. "Verily, verily, I say unto you, s/he that believeth on me, the works that I do, he and she will be able to do also; and greater works than these shall s/he do; because I go unto my Father." Jesus Christ. intention-pile kungfu. The pile kungu of the Shaolin school is divided into two: the plum-blossom pile kungfu and intention pile kungfu. There is a saying in Chinese that Short Power strikes injure the opponent inside without causing him to move much ("da tong") and long strikes cause little impact injury but cause the opponent to fly a great distance ("da fei"). I have read that there are actually several types of methods of performing the "chinese short punch" or "Bruce Lee's 1 and 3 inch punches". The basic type throws the opponent several feet back with practice. The long version (the next level) can throw a person much further back and off the ground, and can be felt through a line of 8 people. The final version (advanced) drops someone on the spot. I found this out via searching for "Chinese short punch" on google. I also realized by using the internet that the iron-palm slap is really just the martial arts equivilent of a pro-baseball pitcher's throw. A strong pitcher's hand moves over 90 mph with the proper wind-up and technique when he throws a fastball. The technique for iron palm is very, very similar. The hand conditioning exercises just strengthen the hand to be able to withstand the force of being thrown at 90 mph at a concrete slab. Don't confuse 'short' hitting with 'shocking' blows. One refers to distance from the target, the other is about how your force is applied. The Chow Gar Praying Mantis Kung fu system is famous for its inch force power. This inch power not only emanates from the fist, but from every part of the body. Inch force power can only be achieved by practicing extraordinary mantis training methods. These methods may at times be hard and boring, but they will give the edge a martial artist needs to win a fight. Termed Gen, inch force is an explosive power that comes from within. There are many forms and drills in the mantis system which expresses this power using short range moves reminiscent of small explosions. In inch power, there is no need to wind up to throw a punch or pull back before striking. With this trained hidden energy, you can instantly explode through your opponent like a lightning bolt attacking a tree. Gen power consists of a number of facets, including explosive power, heavy power, shock power, inch force power, soft and hard power, rooted power, and mind power. One training drill, "Chy sau" or grinding arm, develops the wrist, forearms, shoulders and back. Though it seems a simple exercise, its main task is to push out the vital internal power (Chi) to the fingertips, providing the explosive "gen" power. The bones, joints, and ligaments will become strong and the limbs will possess the heavy arm power. This exercise has 18 variations, each guaranteed to produce a stronger, more powerful fighter. "Doy Chong" or double arm practice develops what is called "say bun lig" or 4 powers. This two-man drill enhances the forward moving power which many have talked about but few have experienced. There are too many training exercises to list but this gives an insight into the style. Ninel Kulagina - demonstrated that she could by mental direction alone, move objects across the table, displnce compass needles, and make a pile of matches explode outwards. And she could subsequently show that by PK, she could separate the white of an egg, which had been broken in a saline solution, from its uolk, and stop the heart of a frog beating. The concentrative effort required to move objects by PK accelerated her pulse to 200 beats per minute, dangerously raised her blood pressure and upset her EEG wave pattern, which are the type of physical changes that normally only occur when a person is suffering great stress. They left the Leningrad housewife exhausted, dizzy, and depressed, and blurred her eyesight. They were eventually to result in a heart attack; this stopped her from taking part in further experiments. Dr John Dee (1527 -1608) Famous Occultist - American Psychic: Jeane Dixon - predictions included: the communist takeover of China, the partition in India in 1947, and the assasination of both Robert Kennedy and Martin Luther King. Buddhist Adepts - Shakyumuni Buddha (Omniscient), Naropa, Tilopa, Milarepa, Gompopa, Guru Rinpoche - Padmasambhava, Karmapa's. Guru's, Adepts, Teachers, Masters Light the Way etc. Tulku's & Rinpoches mastered the Death process and reincarnated for the benefit of all sentient beings. translocation - can travel through space to a devotee - astral travelling? After-thought - Conscience closer to God. Much of this is about developing what Tibetan buddhists call the 'Rainbow Light Body"
When one has developed the Rainbow body when ones physical body 'dies' it disappears and is replaced by rainbows and beautiful light. One who is not fully developed leaves some hair or teeth (or as a momento for devotees!). I was assured by H.H. Penor Rinpoche that one can develop the Rainbow Body in this lifetime and one can start now! The only way is through the Dharma - The Law - The Teachings - The Way of self mastery. Dharma is about learning about the true nature of self & reality and living in accordance with it. This includes mastering the mind-body. EHF has manifested in a large number of cases where children have had unusual and extraordinary abilities. These are the famous psychic children of China who have been documented as being able to read messages that are inside of locked vaults and see through objects. In his book, "Encounters With Qi",(6) David Eisenberg a Harvard trained doctor reveals his experience of two sisters who live near Beijing with "exceptional human function". These young girls were able, repeatedly, to tell what a group of researchers had written on papers that they could not have seen. Dr. Eisenberg also tells of his experience at the Qigong Research laboratories of the Shanghai Institute of Traditional Chinese Medicine. 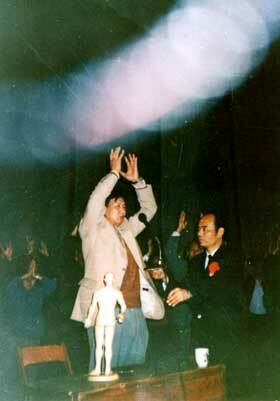 A Qigong master named Lin Ho-sheng caused the movement of an object from a distance of several feet in an environment where no other force could have affected the object. (6) It has been found that EHF is maintained and perpetuated by the practice of Qigong. (5) Qigong has been found to support the development of EHF in certain practitioners who were not born with the skill. In children whose EHF abilities were slipping away with age it was found that the abilities could be regenerated or induced through the use of Qigong exercises. The change of the Raman spectroscopy of water molecules. The change of the molecular structure of DNA and RNA. The change of the surface structure of cancer cells. The reduction of the radiation half-life of isotope Am (241) dramatically -- a previously impossible task by any known physical means. The creation of a prolonged "Bi-gu" (a non-eating state in which one does not eat food because one feels full all the time, intrinsically different from common fast) that lasted for almost six years. During the last 15 years, a considerable number of accomplished scientists from leading universities and research institutes in China and the US, such as Tsinghua University, the University of California (UCSD, UCLA) and Harvard University, have applied modern scientific methods and protocols to investigate biological, chemical, and physical effects of Yan Xin Qigong (YXQ) in critical areas of life science, physical sciences and technology. Some of Yan Xin Qigong research projects have been supported by Chinese National Natural Science Foundation. A large body of scientific data on Yan Xin Qigong phenomena and effects have been scientifically documented. They have been reviewed by Chairman (now honorary Chairman) of Chinese Association of Science and Technology, Dr. Qian Xuesen (Tsien Hsue-Shen), to be "new scientific discoveies and the prelude to scientific revolution" (photo). Prof. Hans-Peter Duerr, colleague and successor of Werner Heisenburg as Director of Institute of Theoretical Phyiscs in Germany proclaimed the Yan Xin Qigong research results to be "within my window of acceptance." (Photo). can interact with and affect matter from molecular to atomic levels. cell membrane, proteins, DNA and RNA). can recognize and optimize genetic properties without adverse effects. can be applied in biotechnology, materials processing and chemical reactions. The healing effects of Yan Xin Qigong have been well documented in scientific research in China, the U.S. and elsewhere. Scientists are currently exploring the reasons behind these effects and it is proving difficult to obtain a complete answer. The following are some of possible mechanisms of Yan Xin Qigong healing effects. Ideally Improving and Regulating the Functions of the Nervous System. Ideally Improving and Regulating the Functions of the Circulatory System. Ideally Improving the Functions of the Respiratory System. Ideally Improving and Regulating the Function of the Digestive System. Ideally Improving the Function of the Endocrine System. Positively Affecting Changes in the Muscular and Skeletal Systems. Adjusting Skin Temperature and Controlling the Body Temperature Center. Adjusting the Electric Potential of the Skin and Changing the Electrical Resistance of the Body. Ideally Improving and Regulating the Immune Function of the Human Body. Enabling Human Beings to Emit External Qi and Transfer Energy. Since 1970, there have been a wide variety of reports that practising qigong and meditation may effect some physiological changes in the human body such as changes in metabolism, oxygen consumption, cardiac output, blood pressure, skin electricity, lactate concentration in the arteries, brain wave patterns, etc. Many reports show that qigong can be very effective for healing some stress-triggered illnesses, such as headaches, migraine, insomnia, and hypertension to name just a few. Some reports even indicate that qigong can cure some diseases and cancers. How does qigong affect human health? What is the real mechanism that qigong meditation triggers that leads to those physiological changes in the human body? Unfortunately, the answer is not yet very clear. This is the main reason that many people in the medical and scientific fields still question the effects of qigong. If we really want to promote qigong and make qigong acceptable to the majority of people, we cannot neglect these questions. As a medical engineer, I always consider this is a great challenge for those of us who care about scientific research in qigong. Since qigong is an inner mind and body training technique based on human consciousness, many scientists believe that the key is in understanding the mechanism of the mind and body interaction. In other words, finding out how the mind or consciousness effects and induces a series of physiological changes in human body is the first step to all the answers. Even though not everyone agrees with the idea that the function of human mind and consciousness is just some kind of bio-electrical activities of our neurons or brain cells, recent developments in psychosomatic medicine have led more and more scientists to believe the human brain is the key to the understanding of the human mind. Dr. David Felten, a well-known professor of neurobiology at the University of Rochester, pointed out in an interview "There is no way to separate human brain and mind because, ultimately, they're one and the same." For this reason, I am very interested in studying the progress of qigong research as it relates to the human brain. Recently, I read a book "A Great Revolution in The Brain World," written by Dr. Haruyama, a medical doctor from Tokyo University. In this book, the author describes very carefully how qigong and meditation cause the human brain to release beta-endorphins. According to Dr. Haruyama, beta-endorphin is one kind of peptide hormone that is formed mainly by Tyrosine (one kind of amino acids). The molecular structure is very similar to morphine but with different chemical properties. Many scientists have found that beta-endorphins can activate human NK (Natural Killer) cells and boost the immune system against diseases and cancer cells. That explains why some patients can cure some diseases simply by practising qigong meditation. For a long time, many scientists believe that human immune system is autonomous and does not have any outside control. However, Dr. Felten discovered that human nerve fibers are in fact physically linked both to the human immune system as well as the nerve system. As a result, more and more scientists start to believe the immune system can be controlled to a certain degree by the human brain. The idea has led to the development of a new area of medical science: Psycho-neuro-immunology, and has attracted many peoples' attentions. Some scientists believe this is the reason why people who practice mind adjustment in qigong can be more in control of their health. The Experiments There are more and more scientific reports today supporting the fact that qigong can effect the immune system and endorphon levels. Dr. Higucchi, in his article "Endocrine and Immune Response During Qigong meditation" (Journal of International Society of Life Information Scince Vol.14, No.2, 1996), reported about some tests conducted on two groups of people. All the members in the "Qigong" group have practised qigong for at least one year while those in the other group (the "Control" group) havenot. Everyone in both groups was checked for their endorphon level before, during and after meditation. After meditating for one hour, most people in the Qigong group showed an increase in endorphin level. By contrast, most people in the Control group showed no significant change while some showed a 35% decrease in endorphin level. Since a higher endorphin level is associated with better enpowerment to the immune system, some doctors start to believe that qigong can be a good healing method for some patients. Actually, beta-endorphins not only can strengthen the human immune system but also are very effective for pain control. For a long time, the mechanism of pain control by acupuncture has been a mystery to scientists. Recent studies show that acupuncture stimulates the hypothalamus within the human brain and induces the release of beta-endorphins that affect the nerve tracts and control the pain. Practising qigong can achieve the same releasing effect of beta-endorphins, as does acupuncture. This provides a good explanation as to why qigong can be very effective for some patients who were suffering from chronic pain. Qigong and the Human Brain Why qigong and meditation can effect the release of beta-endorphins from the human brain? The exact mechanism is not yet clear. However, some scientists believe it may relate to the significant change in the alpha-wave of the EEG (brain wave) patterns. About four years ago, a number of scientists found the alpha-wave of EEG at the frontal lobe of a meditator during qigong state has a much stronger intensity than those taken from a non-qigong meditator. Since the frontal lobe of the human brain has a lot to do with human mind activities as well as a close link with the hypothalamus, a major source for the release of beta-endorphins, many scientists believe the increased intensity of the alpha-wave at the frontal lobe will stimulate the hypothalamus to release more beta-endorphins. That could possibly explain why the mechanism of qigong meditation effects the release of beta-endorphins so as to improve the immune system and the overall health. Obviously, the release of beta-endorphins can only explain part of the picture about qigong and the mind and body interaction. But this is a good start. With continuous research efforts, I believe we would have a much clearer picture in the next few years. So far as qigong is concerned, Dr. Yan Xin has reminded us: "Save Qigong with Science." Of course, Dr. Yan understands that qigong still cannot be fully interpreted by today's scientific standards. I believe what he really means is that only with a solid scientific foundation will qigong be accepted by the rest of the world and thereby making qigong a real contribution to human health. I respect this attitude and I strongly believe this is the right way to promote qigong. Let me continue with the talk on "How to get rid of improper thoughts". Someone asked me: "Why are you so familiar with the methods taught by Sakyamuni Buddha?" Frankly speaking I am a superman who has transcended space and time! "What do you mean by that?" "I live in ancient times." "But you are still around?" "As I know everything about my past lives, I come from ancient time. And I know about my present and my future, I live in modern times." When Sakyamuni Buddha was expounding the Sutras, I was there listening. That's why I know it so well. Sakyamuni Buddha and all his chief disciples may not have cultivated Tantra outwardly, but the truth is that they did, although Tantrayana was never in the limelight at that time. Did Sakyamuni Buddha teach Tantrayana? If he did not, then how did those Arhats attain "Flame Samadhi"? "Flame Samadhi" which was mentioned frequently in Sutra teachings, is a concrete proof that Tantrayana was well and alive during Sakyamuni's era. Therefore, it is a mistake to say only Vairocana Buddha taught Tantrayana to this world. Sakyamuni Buddha also did his part. He taught us "Rainbow Light Great Mudra" as well as "Rainbow Light Great Attainment". During Sakyamuni's time, many of his disciples cultivated Tantrayana and they were able to attain the spiritual level known as "Flame Samadhi". After cultivation, one will have achieved a secret accomplishment known to oneself. After listing to Sakyamuni's Dharma talk, every disciple returned to his own place to meditate - using his own method to enter into deep contemplation. Once in a while Sakyamuni Buddha would come around and teach his disciples. He would write a few sentences to guide his disciples and these guides were later compiled into the Dharmapada. If he wrote, "You must loosen up!" his disciple must have been too tense. On the other hand if he wrote, "You must tighten up ", his disciple must have been too relaxed. For instance, those who always fell asleep would be asked to adopt a more graceful posture. Sakyamuni Buddha used to write short sentences to teach his disciples. "Rainbow Light Great Attainment" stresses a lot on inner cultivation. What is inner cultivation? It is a training to ensure we have adequate Qi (inner wind) in our body. -This is the key to success in inner cultivation. A Tantric cultivator will never appear to be short of breath. I mentioned about "Treasure Vase Breathing Practice" before, you could buy the videotapes from Seattle's Lei Zang Si and watch them. "Psychic heat", also known as "Pristine Fire," is another Dharma from the inner cultivation. I have explained it in great detail. You can also obtain the videotapes from the same source. Although it will be a repetition, I still want to spend some time explaining them to you. As you know, by cultivating "Treasure Vase Breathing Practice", we will have adequate Qi. When the Qi is circulating in our body without blockage and hindrance, we will be strong and robust. This is the great difference between Tantrayana and other forms of cultivation. After cultivating Tantrayana, we need not learn other forms of Qi-gong, as it has encompassed all of them. "Treasure Vase Breathing Practice" is a Qi-gong in the form of a teapot / calabash. Once we have adequate Qi, and they flow freely in our body, we have mastered the art of "Treasure Vase Breathing Practice". And this is the foundation of inner cultivation. Then we must learn to use our psychic heat to ignite inner fire. As you know, our body has such elements as earth, water, fire, and wind. We must use the elements of water and fire to cultivate. The water element concentrates at our brow-point whereas the fire element converges at four finger lengths below our Dan Tian. We must ignite the fire and splash it with water. A psychic heat will arise once water mixed with fire - this is also known as "Pristine fire" Dharma. During Sakyamuni's time, all the accomplished Arhats were able to immerse in "Flame Samadhi". This is a situation where one's upper body ejects water and lower body ignites fire. Having a meditative stabilization in fire and water is a Dharma taught by Tantrayana. Simply put, it is a phenomena caused by adequate Qi in our body. When our veins are unhindered, our energy will converge at one point, and generate heat. Fire will be ignited and eventually lights will be radiated. When lights emit from our body, we will look like an indestructible Vajra. In short, by cultivating Tantrayana, we are able to feel, experience the existence of Dharma and mystic powers. An accomplished Tantric cultivator will never fall sick. He will be as strong and solid as a Superman. The Dharma and mystic powers that we derive from Tantrayana cultivation are not merely lip services or illusions. They are very real; we can experience them and verify them. That's all for today. Positive and negative psychic energy is channelled and absorbed into special mechanisms. Then this energy can be directed towards somebody to cause depression, anxiety and even heart attacks. Psyche, memory and attention span can also be altered. USA was worried that the Soviets might attach a psychotronic weapon to one of its satellites like Sputnik and control countries!! The worrying thing is that since the KGB has dissolved weapons and information are sold to the highest bidder. 1/2 Bn Rubels was spent on development of this technology; where is it now?! Who knows where these weapons are - probably in the hands of the Russian Mafia! INGO SWANN is a parapsychologist and artist with paintings displayed in the Smithsonian. He has published five books including Cosmic Art and Your Nostradamus Factor. He resides in New York City. The PK Man: A True Story of Mind Over Matter by Jeffrey Mishlove , was released by Hampton Roads Publishing Company in October 2000, with a foreword by John Mack, MD , professor of psychiatry at Harvard University. The PK Man presents a story that seems unbelievable, even preposterous. However, in the spirit of William James, we believe it deserves our careful attention. It is an exploration of a scientific mystery -- perhaps, "the very greatest parapsychological find in history." The book documents the extreme, apparent paranormal ability of one human being (the late Ted Owens) to contact UFOs and to influence other large-scale events -- including volcanoes, hurricanes, lightning, and power blackouts. Owens felt that he was the first human being since Moses to exhibit power on such a grand scale. To purchase this book, click here or on the book cover . Free flowing circulation of energy is the foundation of physical and emotional health. Open Psychic Energy Channels presents the complete teaching of the Taoist meditation known as Fusion of Five Elements, Level Three. On this two tape set Master Mantak Chia will present the theory of the Fusion III meditation as well as an explanation of the practice. Then he will guide you through the three Formulas that open energy routes throughout your body, making your whole body extremely permeable to the circulation of vital "chi". In this meditation you will use the "pearl of compassionate energy" (formed in Fusion 2) to open the Great Bridge and Regulator channels in your body. These four channels, combined with the Microcosmic Orbit, the Thrusting Route and the Belt Route comprise the eight special or "psychic" meridians that channel the basic constitutional energy of your body and create a personal psychic protection. - build the wire so you can pass through more energy - instead of burning out -overloading! Three of Dr. Yan's scientific experiments has been published in a paper in the journal Material Research Innovations, Volume 2, Issue 6, ISSN 1432-8917. The paper is titled "Structure and property changes in certain materials influenced by the external qi of qigong". The experiments showed that qi can produce significant structural changes in water and aqueous solutions, alter the phase behavior of liposomes, and enable the growth of Fab protein crystals. Yan Xin Qigong Phenomenon. Beijing Industrial University Press, 1st edition, June,1989; 2nd edition, September, 1989. Master Yan Xin in North America, IYXQA, 1993. The Chinese Superman. Sichuan Literature Publisher. 1988. Yan Xin Qigong and Contemporary Sciences, Translated and compiled by International Yan Xin Qigong Association, 1992. 188p, with many important speeches by Dr. Yan Xin, individual cases of experiences and abstracts of several scientific experiments. Yan Xin Nine Step Qigong, for therapy, health and longevity, translated by Mincheuh Yeh and Longquang Goa, 1992. With valuable illustrations for practice. Yan Xin Qigong phenomenon, in translation. ~300p. Lu ZuYing, Zhao Nanming, Li ShengPing, Zheng ChangXue, & Yan Xin. (1987). Observations on qi emission effects on the structure and properties of some substances. Shengwu Wuli Xuebao (Acta Biophysica Sinica), 3, 93 - 94. Yan Xin, Lu ZuYing, An ShiXian, & Li ShengPing. (1988). 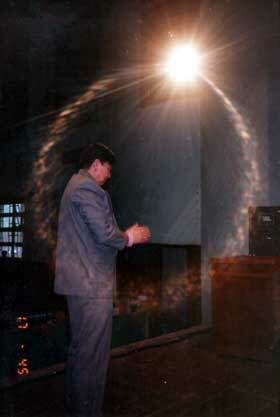 The effect of qigong on the polarization plane of a laser beam. Ziran Zazhi (Nature Journal), 11, 563 - 566. Yan Xin , Li ShengPing, Yu JianYuan, Li Baike, & Lu ZuYing. (1988). The effect of qigong on the Raman spectra of tap water, saline and glucose solution. Ziran Zazhi (Nature Journal), 11, 567 - 571. Yan Xin, Zhao NanMing, Yi ChangCheng, & Lu, ZuYing. (1988). The influence of qigong on the phase behaviors of liposome and liquid crystal. Ziran Zazhi (Nature Journal), 11, 572 - 573. Yan Xin, Zheng ChangXue, Zhou GuangYe, & Lu ZuYing. (1988). The hyperchromic effects on nucleic acid solutions induced by qigong. Ziran Zazhi (Nature Journal, 11, 647 - 649. Yan Xin, Li ShengPing, Liu ChongHui, Hu JinGui, Mao ShangHong, & Lu ZuYing. (1988). The disproportion of CO and H2 mixture induced by qigong. Ziran Zazhi (Nature Journal), 11, 651 - 652. .Li ShengPing, Meng GuiRong, Sun MengYan, Chui YuanHao, An ShiXian, & Yan Xin. (1988). Experimental study on the effect of qigong emission of the molecular structure of matter at a distance of 2,000 km. Ziran Zazhi (Nature Journal), 11, 770 - 775. Yan Xin, Lu ZuYing, Zhang TianBao, Wang Hang HaiDong, & Zhu YunSheng. (1988). The effect of qigong on the counting rate of 241Am radioactivity. Ziran Zazhi (Nature Journal), 11, 809 - 812. 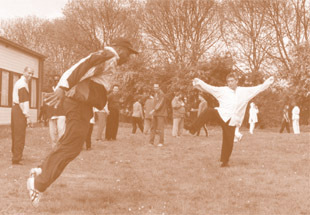 Yan Xin Qigong, IYXQA, 1991. Nine Step Qigong (English, 60 min), IYXQA, 1992. More information look at QiGong and Tai-Chi. http://www.tobew.com The site's general blurb is: Find out what happened when over 500 of the world's top Psychics and Meduims 'Channelled' and ancient, quartz crystal skull called Skully. Information and images that will change the way you think about yourself, your world and all other possible worlds: Forever! http://www.pranichealing.com/courses/kriyashakti.html KRIYASHAKTIsm Science and Art of Materializing Your Wi$hes with Pranic Energy and Thought Power! http://www.codemasters.co.uk/secondsight/ Second Sight - As the new stealth action game from TimeSplitters creators Free Radical Design, Second Sight comes to PlayStation 2, Xbox and Nintendo Gamecube in September'04. Delivering a gripping playing experience, Second Sight combines an atmospheric, thriller narrative with paranormal psychic abilities, stealthy exploration and intense shooter action.